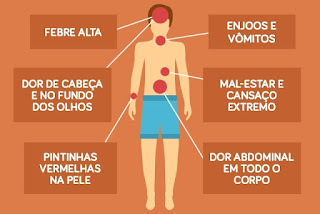 Early symptoms of dengue fever includehigh fever and general malaise , which appear about 3 days after the Aedes Aegyptimosquito bite . 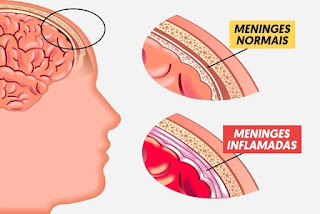 Knowing the evolution of the disease is important not to confuse this with other diseases like influenza, cold, malaria or meningitis, for example, starting the appropriate treatment quickly. In case of suspicion one should drink plenty of fluids and go to the doctor to confirm the illness. In this case, the only drug that can be taken is Paracetamol to relieve pain and fever. See a list of medicines that can not be used because they increase the risk of bleeding. The symptoms of classic dengue are similar to those of Zika, but are usually more intense and last for about 7 to 15 days, while Zika usually goes away within 1 week.However, in any case, it is important to go to the doctor to make the proper diagnosis of the disease and give directions of the treatment to be followed. The high fever has a sudden onset and the body temperature is around 39 to 40ºC.Fever means that the body is beginning to fight the virus through the production of antibodies, so it is important to start the rest so that the body's energies are concentrated on killing the virus. How to relieve: Medications that control fever such as paracetamol, preferably prescribed by the doctor, should be used. Place moist cloths on the forehead, nape and armpits or take slightly cool baths to help lower body temperature. Nausea and vomiting occur due to the general malaise caused by the disease, which also causes lack of appetite and nausea at strong odors. How to relieve: You should consume only small amounts of food at a time, avoiding to consume very hot or very cold foods, as they worsen the malaise. In addition, foods that are easy to chew and digest should be preferred, avoiding salt, pepper and seasoning in general. The headache usually affects the eye region and tends to worsen with the movement and effort of the eyes. How to relieve: Take pain medicines, such as paracetamol, put warm water compresses on your forehead or take ginger tea, fennel, lavender or chamomile. The red spots are similar to the measles spots, but they appear mainly in the region of the thorax and in the arms. The disease can be confirmed by the loop test, in which the appearance of red spots on the skin is observed after tying a wire on the finger. 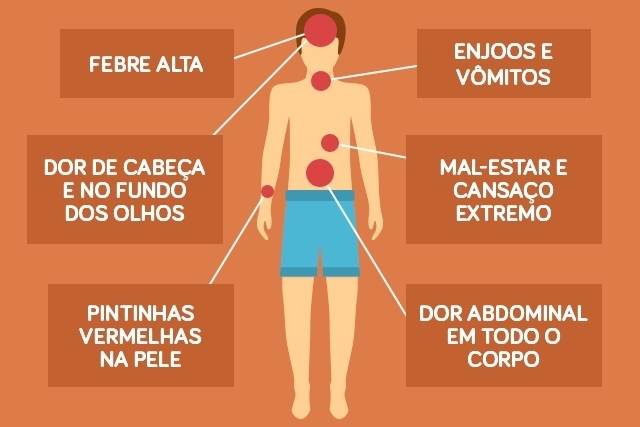 At the medical station, the tie test can differentiate the symptoms of dengue and Zika, because in dengue there is the formation of more red spots in the area evaluated by the doctor. See more about how the tie is made . How to relieve : Dengue stains disappear as treatment evolves and therefore does not need specific treatment. However, it is important to avoid bumps on the skin as they can cause bleeding. Due to the fight to fight the virus, the body spends more energy and causes the feeling of extreme tiredness. In addition, as the patient usually feeds poorly during illness, the body becomes even weaker and weaker. How to relieve: You should rest as much as possible, drink plenty of water to make it easier to eliminate the virus and avoid going to work, class or doing activities that require efforts at home. Abdominal pain occurs mainly in children, while pain in bones and joints usually affects all patients. In addition to pain, the affected region may also become slightly swollen and reddish. How to relieve: Use medications like Paracetamol and Dipirone to relieve pain and put cold compresses on the area to help dislodge the joints. in some cases, it is also possible to appear other signs such as wet, pale and cold skin, as well as lower blood pressure. What to do if you suspect hemorrhagic dengue: You should go to the hospital immediately to receive proper care because this is a serious situation that can lead to death if not properly treated within the hospital. Dengue treatment is done with analgesics and antipyretics, under medical guidance, such as Paracetamol and Dipirone to relieve symptoms. You should not take any medicine based on Acetylsalicylic Acid, such as aspirin or ASA, because they can cause bleeding. To complete the treatment is also recommended rest and fluid intake but the treatment of dengue hemorrhagic should be done in a hospital, with the use of medicines and transfusion of platelets. See other tips to recover faster after the mosquito bite Aedes aegypti. However, in more severe cases hospitalization may be necessary because dengue can cause other diseases that can cause severe dehydration, liver, blood, heart or respiratory problems, for example. See which 5 Diseases can be Caused by Dengue . In infants and children it may be more difficult to differentiate this disease from other common infections, so if the baby has sudden high fever should be taken to the nearest health clinic or pediatrician, so that he can request a blood test and indicate the which may include taking Paracetamol or Dipyrone. What to do if you suspect your baby is sick: You should take your baby to the pediatrician, health clinic or Emergency Care Unit (UPA) so that the illness is diagnosed by a doctor. Generally, the treatment is done at home, offering many fluids to the baby or child, such as water, tea and juices. In addition, it is important to provide an easily digestible diet such as cooked vegetables and fruits, and cooked chicken or fish. However, the child may also have no symptoms, making it difficult to diagnose. Learn how to know if your child has dengue . To know the difference, see the symptoms of the flu . To avoid and prevent dengue it is very important to flip all bottles upside down, put dirt in the dishes of the plants or keep the yard without standing pools, since these are great environments for the development of mosquito larvae. Learn more at Learn How Transmission of Dengue is Made .